Senate To NFL: Change The Redskins' Name : It's All Politics Fifty senators signed a letter to NFL Commissioner Roger Goodell pushing for a name change for Washington's professional football team, a sign the issue isn't going away. Snyder has vowed to never change the name of one of the NFL's most historic franchises. But the letter from the senators — 48 Democrats and two independents who typically vote with them — is a sure sign that the Senate isn't going to accept Snyder's "no" as the last word. In the aftermath of the NBA's Donald Sterling-Los Angeles Clippers controversy — and Commissioner Adam Silver's quick and punitive response — the Democratic senators see an opportunity to increase pressure on the football commissioner to do the right thing, from their point of view. Sen. Maria Cantwell, D-Wash., who circulated the letter, said on the Senate floor Thursday afternoon she hoped Republicans would join her effort to get the NFL to drop the controversial name, which she, like many, refuses to use. She prefers "Washington's football team." "I'll be sending a letter to each of my colleagues asking them to either sign on to this letter or to write their own letter. Because I'm convinced that if each member of this body speaks on this issue, and is forceful in their resolve, that we can help initiate change," Cantwell said. "We believe that Commissioner Goodell should act — that he needs to do what the NBA did [in acting swiftly and strongly] and make sure that one of their owners puts an end to the wrong use of a football term, and to join the right side of history," she said. Actually, it's already too late for Goodell to act with the dispatch of the NBA commissioner. Goodell has defended the Redskins name, saying it was meant to honor Native Americans. Indian groups and many non-Native Americans aren't buying that. Though no Republicans signed Cantwell's letter by the time it became public, some GOP lawmakers have agreed that Washington's NFL team should change its name. Sen. John McCain, R-Ariz., for instance, has suggested as much. On the House side, Rep. Tom Cole, R-Okla., an enrolled member of the Chickasaw tribe, has also called for the name to be changed. Cole signed an earlier letter with Cantwell that suggested that the use of a racial slur was inconsistent with the NFL's status as a tax-exempt organization under IRS rules. You could read that as a shot across the bow. Five Democrats didn't sign Cantwell's letter. Neither Mark Warner nor Tim Kaine, both of Virginia, signed the letter. Virginia is Redskins country, home to many hard-core fans and the team's training facility, in Richmond. For the record, Snyder also contributed $5,200 to Warner during the 2014 cycle, according to OpenSecrets.org. Warner is up for re-election this year. Sen. Joe Manchin of West Virginia also didn't sign. That state has many fans of Washington's football team, though the state also has many Pittsburgh Steelers fans, as well. By contrast, Maryland's two senators, Barbara Mikulski and Ben Cardin, signed the letter. 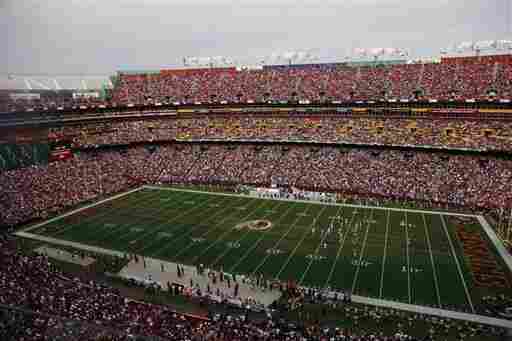 A big part of their state is also Redskins country — and FedEx Field, the stadium where the team plays, is located there. But Maryland is also Ravens country, and both senators call Baltimore home. And it's a very blue state, which makes both senators among the least vulnerable in the Senate. Another non-signer, Mark Pryor of Arkansas, is running for re-election and is considered vulnerable. Arkansas falls under the sway of the Dallas Cowboys, according to a Facebook map of NFL fans based on likes of team pages. Sen. Joe Donnelly of Indiana didn't sign, either. A former small-business owner from a conservative state, the senator often aligns with Republicans.